Teaching elementary school students poses different challenges than teaching middle and high school students. 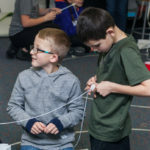 To be able to take complicated STEAM topics and introduce them in a way that is not only exciting but understandable to younger minds is no easy feat. 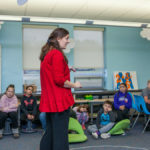 Adrienne Hoffman, the Inventionland and STEAM Facilitator for grades K-5 at Cambria Elementary School is doing just that this year. 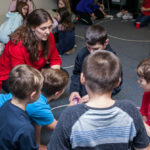 We talked to her about the challenges she faces, her greatest successes, and how parents have supported her in her inaugural year teaching the Inventionland Institute curriculum. 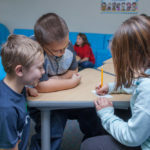 Inventionland Institute (ILI): This is your first year using the ILI curriculum. Tell us about your experiences so far. Adrienne Hoffman (AH): I absolutely love it! 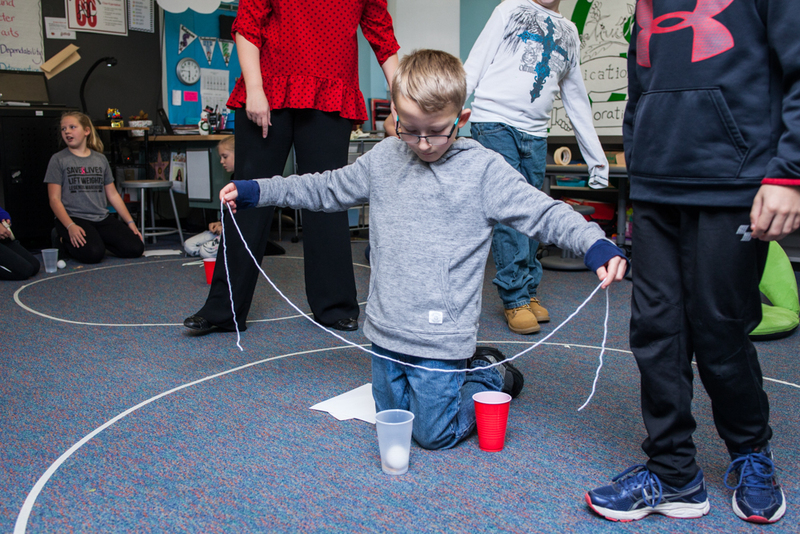 To have students develop an idea about a product and take their idea through Inventionland’s nine-step process is something that has never been done before at the elementary level. 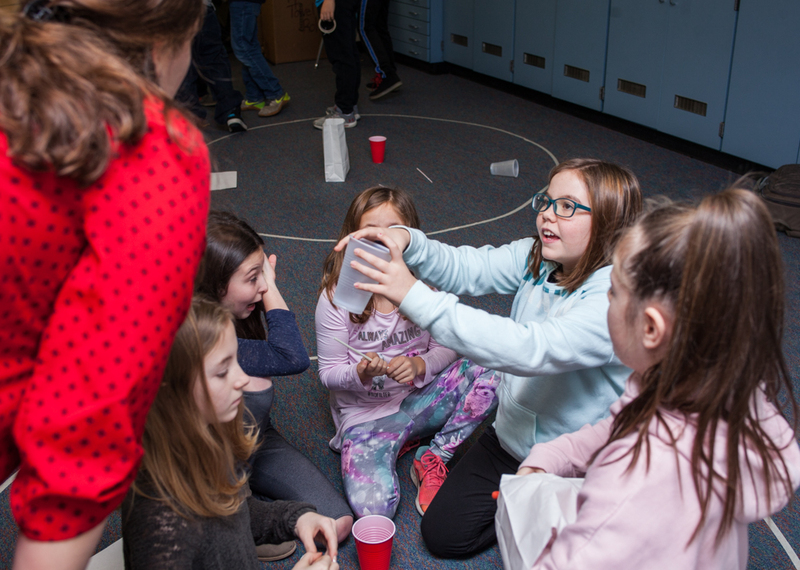 This curriculum requires students to problem solve, think creatively, collaborate with their peers, and then communicate effectively with others which at times is difficult, but it’s very rewarding as a teacher when I see a group’s plan comes together. The challenges that accompany the nine steps are what drives my students each day. It requires them to work together and work through failure as not one class has met a challenge on their first try! I love how it pushes the students to think outside of the box, collaborate, and revise in order to complete the challenge and/or step. ILI: How has parental involvement been with the curriculum? Are parents able to help their kids at home? How much do they know about the curriculum? 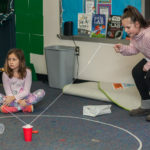 AH: We had a STEAM Night during Parent/Teacher Conferences where the parents were able to come into the lab with their child and complete an engineering challenge. We wanted to give the parents a chance to step into the lab and ask questions about what the Inventionland curriculum actually was. Many parents were able to come and see that night. I sent home a letter with students at the beginning of the year explaining the new lab and what exactly would be taught while in the lab. In addition, I listed some items that, if parents were willing, could be donated to the lab for use throughout the year. The number of supplies I received, and am still receiving, has been tremendous. Inventionland definitely would not work as well without the parents and their willingness to donate necessary items. I have had many students come in and say that they have brainstormed with their parents over the weekend about their product. I have heard from parents that all their child wants to do is invent items while at home. I have even had pictures of students emailed to me working on creating different things at home. I encourage them to bring their inventions into school so they can present them to their Inventionland class! 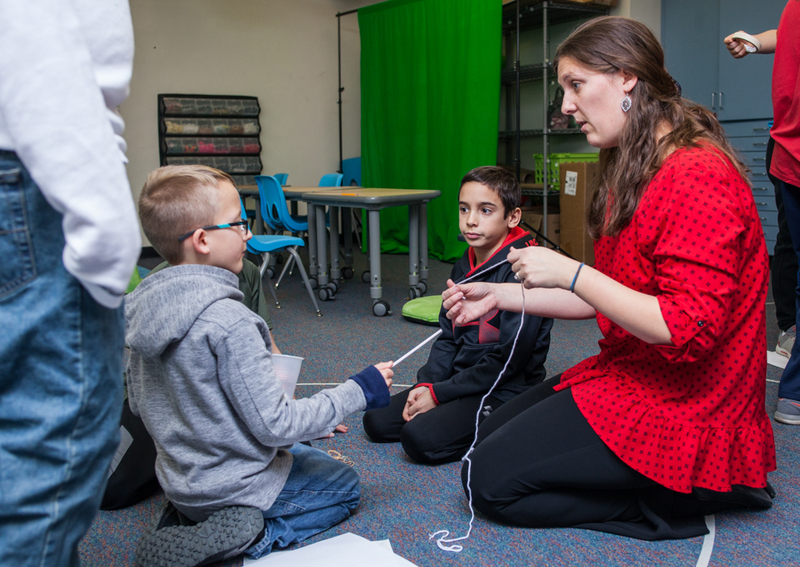 ILI: What is the biggest challenge to teaching STEAM to elementary students? AH: The biggest challenge is having them collaborate with others in their group. 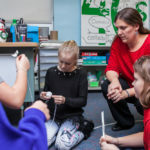 The primary grades are very young and are still learning what it means to work together whereas the intermediate grades want to do everything independently and not rely on someone else. They have difficulty wanting to accept everyone’s opinions and input so getting them to collaborate effectively has been the biggest challenge. AH: My mother is a teacher so I grew up in her classroom and seeing her teach her students. I knew that I enjoyed being around children and would always help in my mother’s classroom after my school day had ended. My mother made such a positive impact on her students’ lives through her way of teaching that I knew I wanted to be just like her, only making my own positive impact on students that I would see and teach. After I came to realize that, the rest of history! ILI: How long are your class periods? How has that played a part in lesson planning for this curriculum? AH: Inventionland is part of our Encore this year where the students will come for a 45-minute block of time. Lesson planning and scheduling is a work in progress. My older students are able to work at a faster pace but take more time with the discussion aspect whereas my younger students need introductions into the Chromebooks we use as well as learning how to research. I like how this curriculum is very flexible so I am able to push back lessons until each class is ready to move on. Sometimes this takes two class periods and others, like Step 2, took four class periods to complete. AH: With my Gifted Facilitator role, I was able to incorporate various forms of technology into my lessons with those students. So far, every piece of technology that has been used in the Inventionland curriculum I have been very familiar with. My advice to teachers and students (and the advice that I have told myself this year) is that implementing a new curriculum or technology is not an easy feat and you will probably have times where you fail. Just as we remind our students that failure is growth, we need to remind ourselves that this is a growing stage. Knowing that failure is okay and what you do to work through your failures, that process, is the key to success. Also, do not be afraid or too proud to ask for help! AH: At the very beginning of the curriculum, students were required to build the tallest structure out of sticky notes. One of my third graders was working on the challenge when I heard him say to his group, “This is making my brain hurt!” I laughed but that statement is evidence that they may just be building a tower with sticky notes, but their mind is in overdrive trying to problem solve how to complete the task. Since then, I have heard others remark about their brain working extra and it is a nice reminder that this curriculum is, in fact, enhancing their ability to think critically and creatively to become excellent problem solvers. AH: Currently I do not. We have started a News Production Club this year and I am working to get that up and running. AH: I attended Penn State University where I received my bachelor’s in Elementary Education. I then went to Marygrove College where I received my Master’s in Reading and Literacy Instruction. 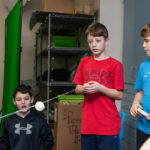 From there, I became the Elementary Gifted Facilitator and this year, I was asked to take on the Inventionland course. Whenever I am not at school, I spend all my time with my family. I have three small children so they keep me busy! They are STEAM driven, so I am able to try out a lot of creations that I would like to bring to the classroom. They drive me to keep asking the question “Why.” I enjoy baking and love that my children want to help me in the kitchen. I also enjoy reading and spending time outside. AH: The goal of the 21st Century classroom is to prepare students to become productive members of the workplace. The 21st Century classroom is student-centered, not teacher-centered. Teachers no longer function as lecturers but as facilitators of learning. The students are learning by doing, and the teacher acts as a coach, helping students as they work on projects. 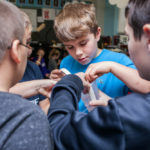 Students learn to use the inquiry method, and to collaborate with others–a microcosm of the real world they will experience once they leave the classroom. Teachers are entrusted with mastering the 21st Century skills as well as with modeling these skills in the classroom. The characteristics of the 21st Century classroom will be very different from those of in the classrooms of the past because the focus is on producing students who are highly productive, effective communicators, inventive thinkers, and masters of technology.